From 1901 to 1904 Picasso travelled between France and Spain. 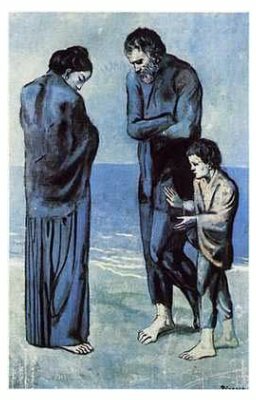 These years comprised Picasso's so-called Blue Period., named for the monchromatic palette he used to depict largely drawn from the socio-economic underclass in Barcelona and Paris. His choice of blue as his means of pictoria; expression accentuates this feeling of hopelessness.